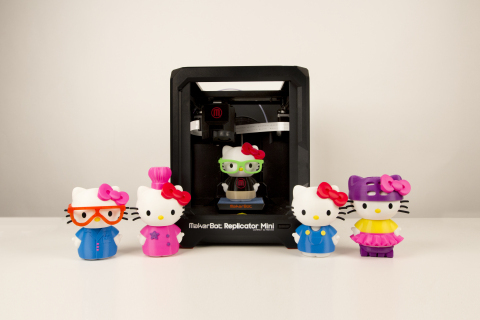 BROOKLYN, N.Y. & LOS ANGELES — (BUSINESS WIRE) — October 30, 2014 — MakerBot, in partnership with Sanrio, is excited to announce that 3D printable Hello Kitty® collectibles and accessories are now available on the MakerBot® Digital Store and in the MakerBot PrintShop™ app! In celebration of Hello Kitty’s 40th anniversary, MakerBot and Sanrio have collaborated and designed a line of 3D printable Hello Kitty collectibles, which can be 3D printed exclusively on MakerBot Replicator® 3D Printers. The collection debuts at Hello Kitty Con, the first official Hello Kitty convention, taking place at The Geffen Contemporary at MOCA (The Museum of Contemporary Art) in Los Angeles on October 30, 2014, and are available on the MakerBot Digital Store and in MakerBot PrintShop, MakerBot’s free app (available for download from iTunes) that is geared to unleash the inner designer in everyone. The MakerBot Hello Kitty 3D printable content is expected to be available on the MakerBot Digital Store in two installments, starting on October 30 with a deluxe Hello Kitty 3D printable figure and five snap-on 3D printable outfits. Prices for the digital designs on the MakerBot Digital Store start at $3.99 per digital model. Also being released on October 30 is a Hello Kitty & Friends ring topper pack in MakerBot PrintShop. With this tool, would-be designers can easily create rings in the ring maker module of PrintShop that feature Hello Kitty, Bad Badtz-Maru and My Melody. Prices for the digital designs in MakerBot PrintShop start at $0.09 per digital model. Additional Hello Kitty accessories (comb, barrette, stencil and more) are expected to be available on the MakerBot Digital Store in November. MakerBot, a global leader in desktop 3D printing, created the MakerBot Digital Store to sell original, fun and collectible 3D printable items, and the MakerBot PrintShop app is an easy, fun and free way for anyone to create all kinds of cool 3D printable items. The MakerBot Digital Store and the MakerBot PrintShop app are designed specifically for use with MakerBot Replicator 3D Printers. For more information on MakerBot and its products visit makerbot.com. For more information on the MakerBot Digital Store and its licensed characters, visit makerbot.com/digitalstore. For more information on the MakerBot PrintShop app visit makerbot.com/printshop. For more information on Sanrio, visit sanrio.com. MakerBot, a subsidiary of Stratasys Ltd. (Nasdaq: SSYS), is leading the Next Industrial Revolution by setting the standards in reliable and affordable desktop 3D printing. Founded in 2009, MakerBot has built the largest installed base of desktop 3D printers sold to innovative and industry-leading customers worldwide, including engineers, architects, designers, educators and consumers. To learn more about MakerBot, visit makerbot.com. Sanrio is the global lifestyle brand best known for pop icon Hello Kitty®, who celebrates her 40th Anniversary this year with a museum exhibition and Hello Kitty Con 2014, the first ever Hello Kitty convention. Home to many endearing characters including Chococat® My Melody®, Badtz-Maru® and Keroppi®, Sanrio was founded on the “small gift, big smile®” philosophy – that a small gift can bring happiness and friendship to people of all ages. Since 1960, this philosophy has served as the inspiration for the broad spectrum of unique products and experiences. Today, more than 50,000 Sanrio-branded items are available in more than 130 countries and upwards of 15,000 U.S. retail locations including department, specialty, national chain stores and over 80 Sanrio boutiques. For more information please visit www.sanrio.com and www.facebook.com/hellokitty .